In the aftermath of her brother's suicide, Lexie comes to terms with her grief. It grows so intense at time, that she becomes convinced that her brother's ghost is still lurking in their house and she seeks solace from a long-forgotten friend with an interest in the supernatural. The process of grieving is lengthy and involves coming to peace with her parents and her friends, as well as understanding what pushed her brother to the brink. While Hand acknowledges that the story is inspired by her own tragedy, I'm prone to accept her assertion that it is a work of fiction. Still, having lost a loved one to suicide obviously helps her to flesh out a story which is rich with detail. 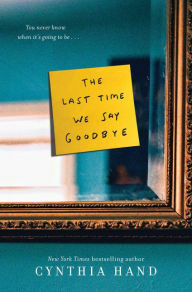 Premature death and grieving for it are common YA themes and this story does not break any particular new ground, but it is exceptionally well-written. So, of all of the many options available for this subgenre, I'd recommend this one in particular. The setting is realistic, the characters deep and compelling, and the story well-told. Unlike so many other examples, Hand manages to tell her story without the tired tripe of recounting the Five Stages of Grief (in order!) -- Lexie's progress is more organic. And finally, for the detail-obsessed, Hand's description of Lincoln Nebraska is spot-on (although lacking the much-anticipated Runza reference! ).